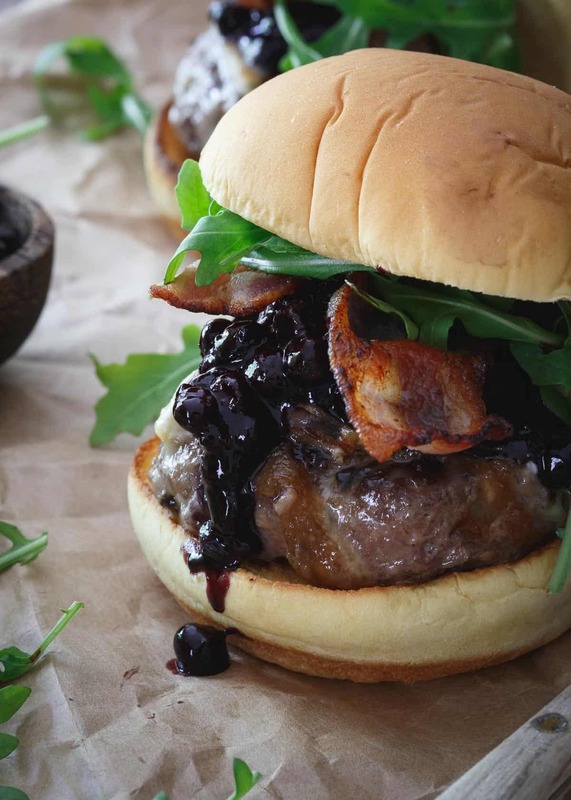 This brie burger is topped with a sweet and tangy blueberry BBQ sauce, crispy bacon and fresh arugula. For at least 15 years, a group of us have rented a piece of property on the lake in the town I grew up in. Knowing someone with lake rights was clutch growing up. There’s essentially no public access yet the lake is the place you wanted to be in the summer. Luckily for me, I always had a friend or neighbor with an in and then as an adult, we’ve had this property. Well guess what? After 15 years of renting from this ancient woman (seriously, she must be in her mid to late 90s) who lives in NYC and has had no desire to even bother driving the hour north to check on her property in the last 15 years, all of a sudden (the year we finally buy a boat, mind you) her son decides he wants to use it for the summer. Long story short, we happened to know someone selling a piece of property around the lake and a few phone calls/emails later, we decided we’re buying our property. This was April 1. Except, do closings ever happen on time or go how they’re supposed to? Considering the amount we’ve gone through at this point in our lives, you’d think I would’ve known better. Almost two months later, here we are STILL waiting on the survey company to finalize things so we can close on the property. With each day that passes, I see my Memorial Day boating dreams vanish and a small part of me wants to cry since I won’t be spending the unofficial start to summer in a bikini on the boat, getting a tan while blasting country music with a beer in hand because that’s literally all I’ve been visualizing for the past 2 months. The positive to this otherwise sad predicament is that I can eat all the blueberry BBQ brie burgers I want. Grilling at the lake and grilling at home are two completely different experiences. At the lake, we’re lucky if I remember utensils and plates let alone condiments. At home, with my fridge at my disposal, blueberry BBQ sauce and fancy brie burgers made with Certified Angus Beef® brand (because it’s the best!) become a possibility. And that takes away just a teeny tiny bit of the sadness. 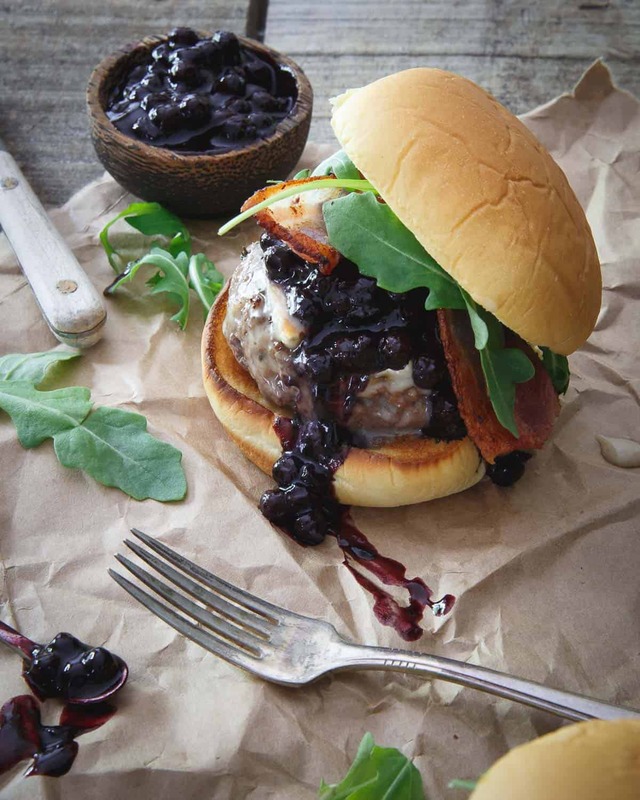 This blueberry BBQ brie burger is part of the #BurgerMonth celebration hosted by Girl Carnivore. Combine all the ingredients in a small sauce pot, bring to a boil, lower heat to a simmer and cook, stirring occasionally for about 15 minutes until reduced and thickened. Set aside. Combine the ground beef, garlic, onion, herbs, salt and pepper in a bowl. Mix together with your hands and form into 4 patties. Cook burgers on the grill until desired doneness. Top with brie slices 30 seconds before burgers are done to let soften. 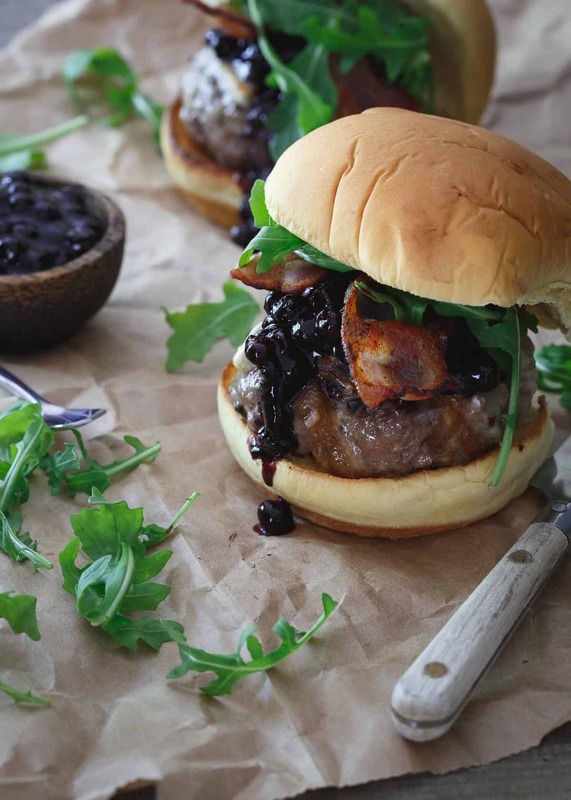 Place the burgers on the bun (use gluten-free if necessary), top with the blueberry BBQ sauce, bacon and arugula. Love love love the blueberries!! That’s awesome. I mean, not the part about the delay, but the whole lake cottage thing is great! Hope you get in there soon, and can live out your boat, tan, beer and country music dreams! Oh, and this burger… amazing! Wow! That burger looks great! What a fun twist to put blueberries on it! Love the salty/sweet combo! 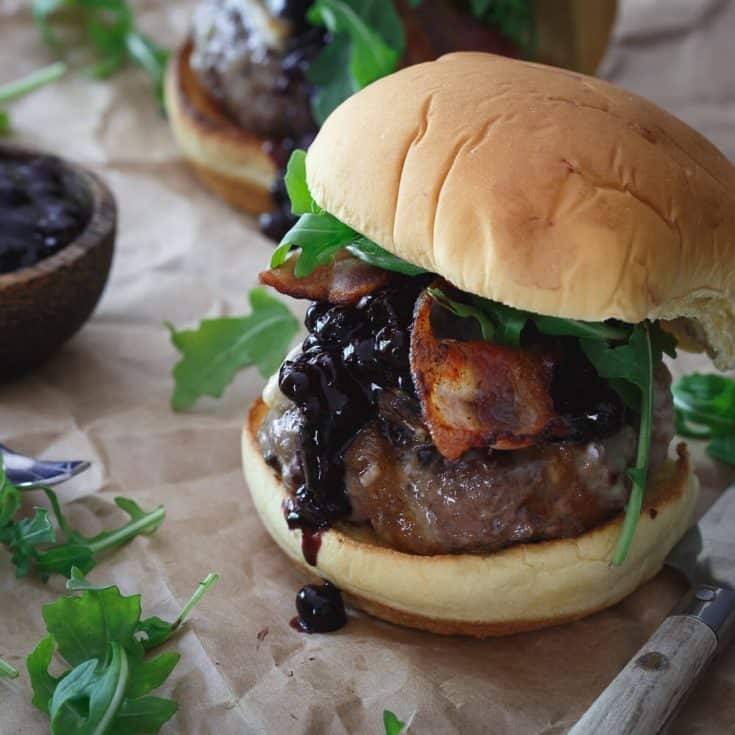 I love blueberries and I love Brie, they look absolutely amazing on this burger! Blueberries and beef go so well together! Then there’s the bonus of brie – Yummy! Aw, I really hope that wherever you are, you can make a wonderful Memorial Day out of anything, and I’m sure you will! Anyways, I’m not a huge burger person, but I generally like to pile on the vegetables and Sriracha on a nice veggie tofu patty or salmon patty! Delicious! I was pretty shocked to see the blueberry combination with the beef! It looks interesting! Hey girl, I sincerely hope the lake works out for Memorial Day. If not, there’s always July 4th. It will be so awesome to have your own place, excited for you and your pals. What a gorgeous burger, I’ve seen blueberry barbecue sauce before and wondered what it tastes like. Add in the brie and oh my word, I am so craving this amazing burger!!! Looks wonderful! My favorite BBQ hack thus far has been mixing cranberry sauce with BBQ sauce. I’ve been wanting to try a blueberry version for a long time, but hesitant to try something new. Thanks for the inspiration! I do not think you will regret your decision–we just sold our boat and we miss our days on the lake. They are simple, yet precious! Too bad we live too far from the lake now! Oh and these burgers–incredible!! Love sweet and salty and the argula is key!